AT&T is buying TimeWarner for what will be about $109B with debt -- and will mean that AT&T will have more debt - $175B approximately - than any other institution -- at a time when their growth is slowing. 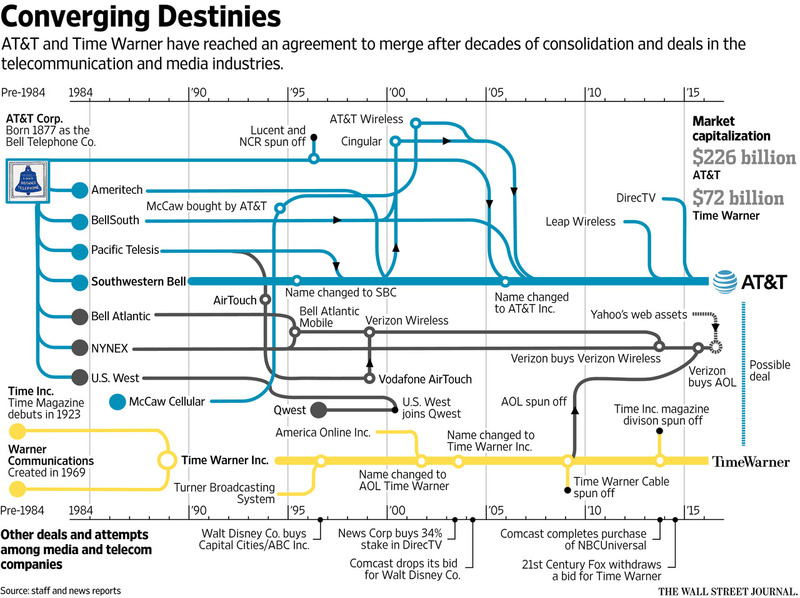 The Verge had an article that pointed to a WSJ infographic of the telecom consolidation. There are actually 2 charts: here and this 2011 one. When this is done both Bells will have a combined debt of almost $300 Billion dollars and revenue that will be less than that. The markets they are in are hyper-competitive - cellular, broadband, TV. T-Mobile is clobbering them. TV is cutting the cord. Cable is winning the broadband war. While AT&T was being a jerk to Google Fiber, cable stole its lunch money every single day.